Let your inner harry potter craze go wild and try these Harry Potter Decor DIY to get the magical decor! A magic is nothing without a wand! For a harry potter decor, this magic wand project becomes a must to consider. You only need a few cooking chopsticks, foam brush, glue gun, and assorted acrylic shades of brown. The blogger here has a detailed tutorial. Process this homemade butterbeer to celebrate any special occasion with a touch of harry potter in it. Get the ingredients and other details here. If you have read the initial harry potter book you must be familiar with platform 9 3/4. Craft this label to represent a wizarding world in your home decor. Get the idea here. Plan your this year’s harry potter party with a set of this prisoner of Azkaban wanted posters. Just basic supplies and this tutorial can help you complete this project. Get crafty this winter and create this harry potter essence dobby sock holder. Making this themed sock holder is easy and clever. Here’s the idea. How about creating a Nimbus 2000 for your next harry potter themed party? The Instructables has a full tutorial on this. Flaunt your passion for the game of Quidditch and harry potter with this golden snitch idea. Here at WikiHow, you get 3 different ways to make a golden snitch ball using ping-pong ball, styrofoam ball, and Christmas ornament. You can use this Quidditch robe in a three-way purpose namely as Halloween costumes, for a harry potter party, and just for fun. Find help here. Reproduce the prophecy ball from the Harry Potter and The Order Of Phoenix with this easy to do idea. Isn’t it interesting? Visit More Than Thursdays for the steps. A supportive DIY for the very first idea that we listed in this list. 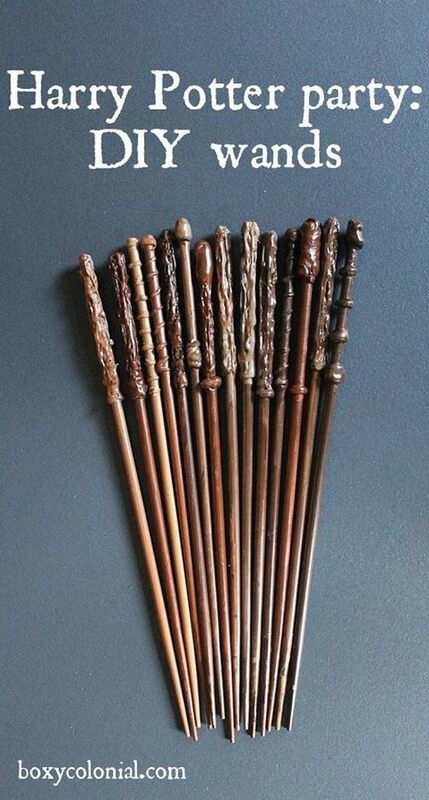 No need to store wands in a container rather make a display for ’em. Personalize this wand display with this video tutorial. While the glue is the basic material to create a slime glitter can add a magical effect to your potion slimes. Watch the youtube tutorial for the steps here. Turn a simple plastic egg into this magnificent golden egg inspired by The Harry Potter. If you have been searching for something unique to do this is surely your stop! See here. Draw wings on paper and glue them on old vintage keys that you may have at your home. If not then you can shop for a few online. In order to hang these from the ceiling, attach a fishing wire to the keys. Use twine and some craft supplies to imitate this bunting craft for your kid’s room. Choose your favorite harry potter house to write on your bunting. Craft a decal inspired by harry potter, which may not be able to direct you to the Hogwarts but can definitely add the fun to it’s surrounding. Design and paint your design with acrylic paint onto your wall! In case you are really proud of the way you write, undergo this amazing harry potter quote DIY. If you think this isn’t your cup of tea, you can search for it online. Knit a blanket in the color of Gryffindor to make your kids feel as if they are really the Gryffindor dorm room. Choose yarns that match the house’s color and begin with simple blanket knitting procedure. This is the right way to use the golden snitch that you made in point seven of this list. Get inspired by the image above and let your creativity lead you to the end result.